“Laughter, cries of fury and howls of anguish rang out intertwined and tangled, blood flowed everywhere, nails dug bloodily into fat flesh. With a feeling of sorrow and depression Klingsor awoke for a few minutes. His eyes, wide open, stared at the bright gap in the wall. The faces of the embattled women still lingered, and he recognized and named many of them…in a hoarse voice, still caught up in the dream, he said: “Children, stop it! You’re lying you know, you’re deceiving me, you know; it’s not each other you should be tearing to pieces but me, me!”” Hermann Hesse, Klingsor’s Last Summer (1920). To celebrate the Maestro’s 204th birthday, and in anticipation of a concertised version of his last great work (in Sydney in August featuring Jonas Kaufmann), the Richard Wagner Society of SA screened the Met’s beautifully photographed 2013 production, as designed by François Girard, conducted (from his memory!) 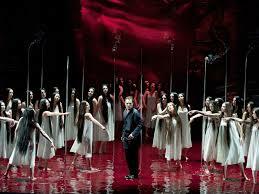 by Daniele Gatti, with a dream lead cast, plus a fine choral support. The Varnished Culture thinks of Parsifal as Wagner’s weirdest work, a scourged, suppurating wound from which the plasma of his life, his work, his various characters and characteristics, his cosmic, symbolic and mythological luggage, and his tendency to self-deification, spill and combine in a mighty torrent of feeling (if not meaning). We seem to have a Siegfried-Lohengrin figure in Parsifal (the pure and incorruptible dummy, who learns his name and eventually, all about empathy and compassion), an Alberich in Klingsor (a mad magician with a gift for appropriation the magnitude of his creator’s, the former stocking-up on relics, the Maestro on religious mythical symbols), and a sort-of Tristan-Tannhäuser in Amfortas, who falls from love and gains absolution in the last reel (though, in his case, not as a tree). And this divinely insane concoction plays out to some of Wagner’s most gorgeous, economical, and apposite music. That music started at a somewhat stately pace, with such delicacy that one expected Gatti to be wielding sugar tongs rather than a baton, but the slow tempo suited Act I’s static and expository mood. The sets and choreography (by, respectively, Michael Levine and Carolyn Choa) were, to our mind, perfect: a ravaged, parched, treeless landscape with a huge backdrop of weather and neat, fragile figures adjacent a small, clear stream, the crowds choreographed in an aesthetic, even moving manner. Act I belongs to Gurnemanz (René Pape), Kundry (Katarina Dalayman) and Amfortas (Peter Mattei): their vocals were superb, virtually flawless (and the men were terrific players as well, Pape magisterial as the old knight and Mattei tormenting us with an astounding portrayal of genuine torment, a man wracked with guilt and incurable by men.) Kundry has a somewhat thankless role, particularly in Act 1, but her eye-rolling needed some palliative balsam after a while. Parsifal is very passive, almost an onlooker at this stage, apart from his kill-crazy swan rampage, and with everything sans wings (Gurnemanz’s sorry tale of the fall of the Knights of Monsalvat, the theft of the spear of Longinus, the revolting, weeping wound to Amfortas, and the imperilment to the Grail and its sangue réale) going straight over his head. 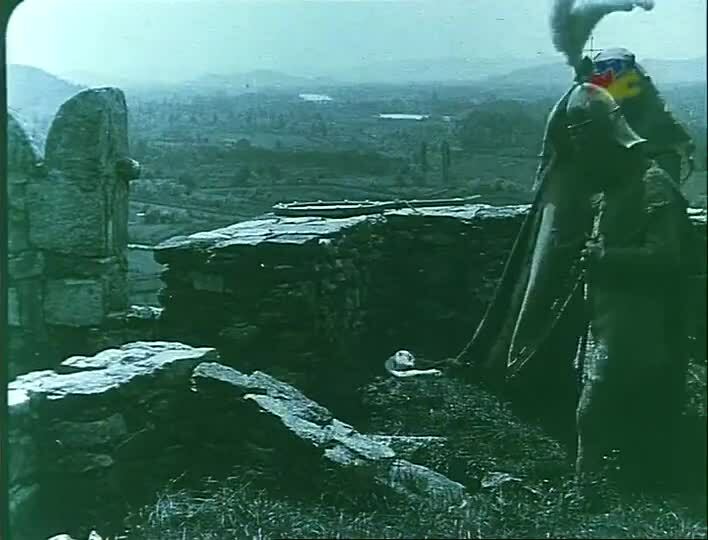 Then comes the volcanic activity of Act II, where blood and bleeding co-star as a turgid jet, a bottomless lake, an unholy bed; when our lad storms Klingsor’s castle (much like Lancelot in Monty Python and the Holy Grail). Our novice carves his way through errant knights and resists the prost…sorry, ‘flower maidens‘ (whose blood-stained slips recall, in an icky way, Malcolm McLaren’s “Madame Butterfly”), eventually confronting Klingsor, and depriving him of the holy spear. Evgeny Nikiitin as the necromancer is very nasty (and very good), his grounds and his form drenched in blood and guarded by pikes. 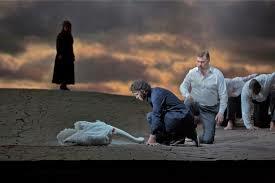 Before this climactic showdown, however, Kundry comes into her own, and her exchange with Parsifal is earth-shattering. This exchange could be the ne plus ultra of Wagner’s preternatural art. Despite some impatience with Parsifal here (Dennis Forman, in his funny, wise and irreverent Good Opera Guide, refers in this context to the hero’s “impenetrable stupidity”), his resistance of Kundry’s brilliant tactics, encompassing tropes from Venus to Freud, is simply astonishing – arguably divine, in fact. (Wagner outdoes himself here, his invention flirting with taste and decency so as almost to blaspheme.) Parsifal reacts to her wiles by singing of the temptation and anguish of Amfortas (and Kaufmann uncorks the bottle and reveals his vocal power and acting charisma – he is an opera ‘rock star’, and we look forward to hearing him live – our Society’s President assures us that he really is the goods) – see an extract below.